The popularity of cycling is growing rapidly in several Mexico cities. Mexico City has created bike lanes, an Ecobici system for short-distance hires, and holds numerous cycling events and rallies, designed to appeal to the whole family, not just to commuters. “Over the Wheel—Mexico” takes a look at the growing cycling culture in Guadalajara, a city of some four million people and almost two million motor vehicles. It looks at the dedicated work of several committed groups of activists, such as GDL en bici [Guadalajara by bike], who are striving to persuade car owners to change their habits and make the streets safer for alternative, cleaner corms of transport such as bicycles. Among other things, the activists have begun a “bicicleta blanca” movement in which white-painted bicycles are mounted as a memorial wherever a cyclist is killed in a traffic accident. 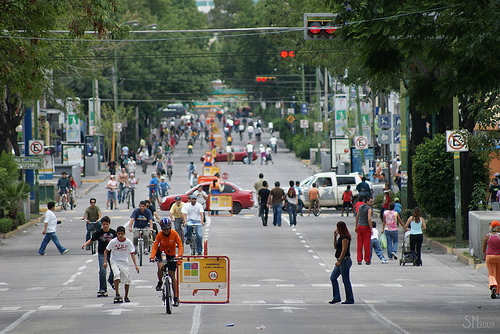 Can cyclists reclaim the streets of Guadalajara from cars? This 25-minute documentary, which has Spanish language commentary and English subtitles, looks at how a quiet revolution in sustainable urban transport is slowly unfolding in Guadalajara. Further evidence of the growing popularity of cycling in Guadalajara is provided by the success of the weekly “Via RecreActiva” (see image). Every Sunday, city officials close over 65 km (40 mi) of city streets to motorized vehicles for six hours from 8 a.m. to 2 p.m. Up to 200,000 people take over the streets. Most are on bicycles, but others are walking, jogging, rollerblading or skateboarding.